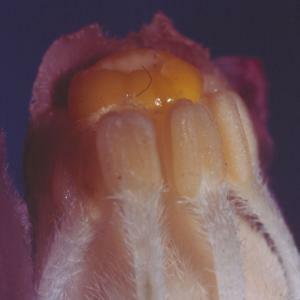 The upper portion of a flower of Hemitomes just as it opens reveals that the anthers are still closed, but the yellow stigma is sticky and looks receptive. If this is true, the flower would have to be pollinated by pollen from another flower. That's a way in which cross-pollination between plants could be achieved. Nobody knows what insect pollinates Hemitomes.